An amazing kind of Digimon figure is coming to you from Bandai Tamashii Nations! Fans have enjoyed the articulated materpieces from D-Arts and SH Figuarts in the past, but in this one Taichi and Agumon come to life in signature Figuarts ZERO style with the ultimate sculpt and precise detail! In this particular Digimon Adventure tri. 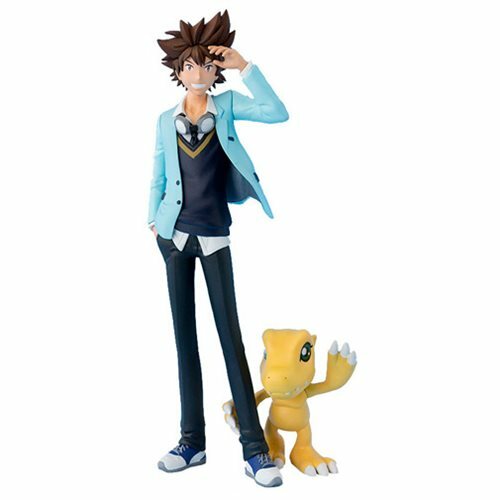 rendition, Taichi appears as a high school student with trusty Digimon partner Agumon standing at his side. This beautifully crafted statue is perfect for Digimon fans old and new. The set also includes a unique display stand! Measures approximately 6 1/4-inches tall. Ages 15 and up.